Guiding Question: How many different ways can you master to greet someone and introduce yourself to him/her? Procedure: Review story of Creation. The Bible doesn’t tell us, but ask students how Adam might have introduced himself to Eve. Ask students what greetings and introductions they have mastered. Discuss the concept of formal versus informal introductions. Have the students provide as many examples of each as possible. Supplement as necessary with other common greetings and introductions. Have the students use the costume materials to assume an identity. Students should decide if their character would expect a formal or informal greeting. Have students attend a “party” as their character. 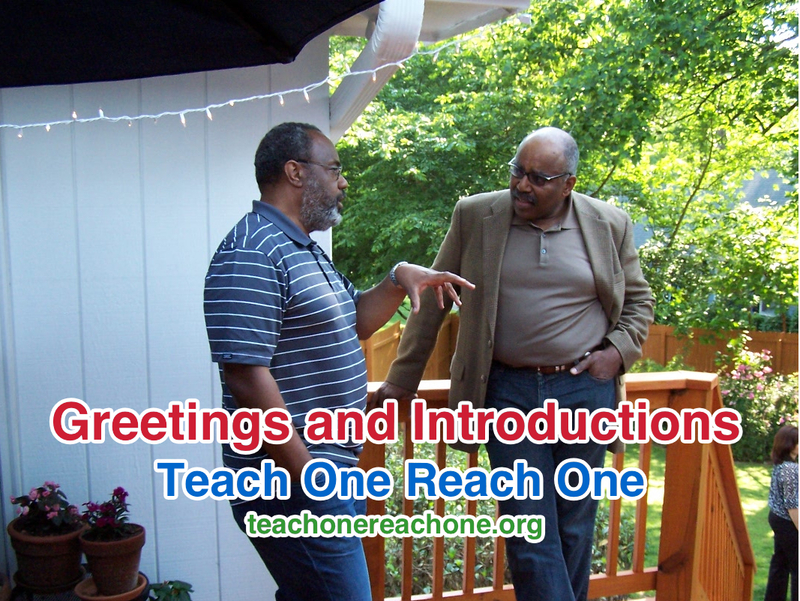 They must meet everyone at the party using a variety of greetings and introductions. Monitor the “party” and point out students who are especially creative and use a wide variety of greetings and introductions proficiently. What greetings vary based on your geographic location? What are all of the factors that can help determine which greeting and/or introduction you use? Supplemental Activity: Once students are comfortable, repeat the activity without costumes. Invite native English speakers to a “party” and have the students circulate, greeting their guests and introducing themselves.